I haven't written anything about the impending disengagement from Gaza, because I haven't had anything to say about it. I guess I am thinly pro-disengagement, but I couldn't give you a good argument as to why, so I'd rather keep my mouth shut. 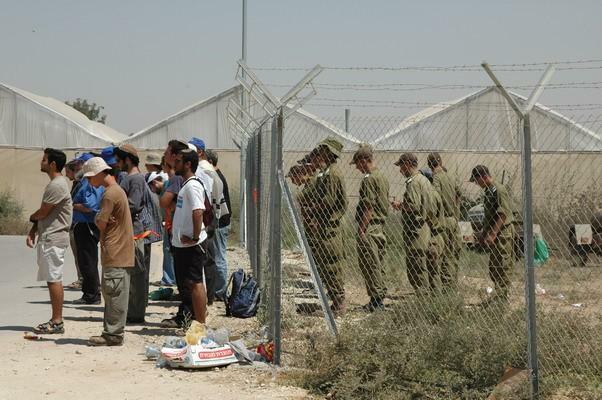 This photo of a mincha minyan on two sides of barbed wire at Kfar Maimon, which I saw on Mirty's blog, but which was originally posted on Lamed, the ATID blog, left me feeling kind of sad and confused. I also found it moving in sad way. I'm not 100% sure what else I can say about what or how it made me feel, but it definitely made me feel something, so I felt it was worth sharing.